There’s still a battle among the top three cloud providers. Amazon remains the leader with Microsoft on its heels. Google might be lagging behind, but it’s not out of the race. It’s no longer the question of whether to leverage cloud technology. It’s now a question of which one. Each cloud has benefits for different types of users. We explore what makes these platforms popular among certain crowds. AWS. Since its inception, AWS has been the dominant cloud provider in terms of market share, and 2018 was no exception. According to Amazon’s quarterly sales results, AWS saw $25.7 billion in revenue in 2018, the highest among all cloud providers. It also boasted a 47% annual growth. This isn’t surprising considering AWS had a seven-year head start before Microsoft and Google entered the public cloud space. As a result, AWS services are by far the most evolved. Azure. In their 2018 annual report, Microsoft reported $23.2 billion in commercial cloud revenue, a value that pools together the revenue of several cloud properties — Azure being one of them. That number is deceiving though. It may seem like Azure is within reach of passing AWS in revenue. But Azure’s revenue is bundled with Office 365 on its 10-K financial report, so this may not be the case. Analysts estimate actual Azure revenue at around $13.5 billion in 2018, which represents an incredible 82% annual growth. However, Azure is still significantly behind AWS in market share at 13.7%. But even with the drastic difference, Azure still secures the second spot for highest market share among cloud providers. GCP. Google hasn’t reported its cloud revenue for 2018, yet, but Canalys estimates Google’s cloud revenue at $6.8 billion, representing annual growth of 94%. That secures Google’s spot for the third highest market share. On the surface, it seems like cloud providers offer the same thing: a cloud platform and cloud services. While that’s true to an extent, it’s not as generic as it seems. For example, if you focused solely on compute services for AWS, Azure, and GCP, the pricing looks simple. However, it gets more complicated. You can choose from a wide variety of computing types with different uses and different pricing. With AWS alone, you can choose from 10 operating systems and more than 150 instance types. Azure has similar numbers. Throw into the mix the many flavors of storage and the potential for multiyear discounts, and pricing gets convoluted. Because of these many differences, it’s difficult to compare the costs of using each provider. At times, it’s like comparing apples to oranges. In other cases, it’s like comparing apples to shoes — not even in the same category. 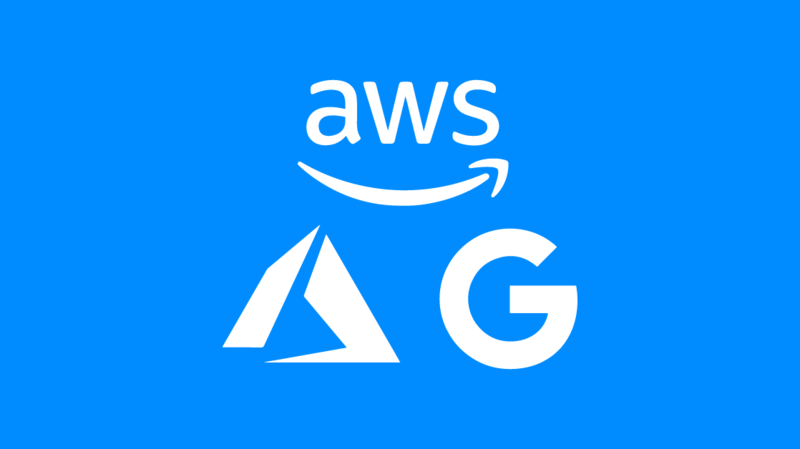 If you plan to make a decision between the three based on price, AWS, Azure, and GCP each offer a calculator you can use to estimate their monthly costs. AWS, Azure, and Google have roughly the same high-level features. They all have compute, storage, and other services. The third category has the greatest potential for differentiation. If you’re just going to host a simple website or app, then it’s simple enough, and probably comes down to cost. Many people select their cloud provider for specialized services, like analytics or machine learning. Here’s a high-level feature overview of the three cloud providers. AWS. AWS is the Swiss Army knife of cloud providers. There’s just about everything you could ever want and then some. However, its greatest strength — the abundance of services — is also its greatest weakness. Some find it difficult to keep up with the new service innovations offered by AWS. CBT Nuggets trainer Anthony Sequeira did a webinar on this very topic. Amazon has hundreds of services, so where should you start? With so many services, it can be burdensome to understand and manage the costs that accompany the many services. But, as Anthony points out, AWS has a ton of services, but most users only need a couple to get started — EC2 and S3. Gartner calls AWS the “safe choice” for customers that need, or may one day need, a wide range of services. Azure. Azure doesn’t have quite the breadth of AWS, but they’re getting there. At latest count, Microsoft offers 154 Azure services ranging from Bing Custom Search to mixed reality apps. CBT Nuggets trainer Ben Finkel explains why Azure stands out against the competition in 15 minutes. The thing that really puts Azure ahead of AWS in many circles isn’t a service at all — it’s interoperability. While AWS maintains a singular focus on public cloud computing, Azure cloud caters to those who want to interoperate with their own data centers. In short, this means Azure has a hybrid cloud option — and they’re banking on it to edge out AWS. We know that because they’ve said as much. Lastly, Microsoft is finally playing nice with other technologies, including Linux and VMware. That will go a long way toward expanding their market share outside companies that run Microsoft stacks. GCP: Google has always been known as a pioneer, and that reputation continues with its cloud platform. GCP’s greatest strength is its innovative capabilities. With specialization in analytics, machine learning, Big Data, and containerization, Google (and therefore GCP) seems ahead of the pack in terms of IT-focused services. CBT Nuggets trainer Garth Schulte explains why many companies have chosen Google Cloud Platform in about eight minutes. Google is also an open provider, meaning their ecosystem is centered on open-source technology. To many in the IT world, that’s important. If you have an aversion to proprietary offerings — which is something you’d see in an Azure platform (though they’re working on becoming more “open”) — GCP could be a great option. GCP also has its weaknesses. Though GCP’s infrastructure is second to none, it’s limited in scope. They don’t offer as many services and features as AWS or Azure. This could make it difficult to leverage as a one-stop shop for specialized applications. This section was written by CBT Nuggets trainer Bart Castle. He brings more than a decade of cloud computing experience to CBT Nuggets. He’s earned every core AWS certifications, making him one of the few instructors worldwide to earn AWS Authorized Instructor Champion status. Prior to the cloud, there was a pervasive feeling of uncertainty that often prevented progress. It caused us to buy servers that were too big, which led to us having unused capacity. It caused us to buy licensing bundles that had too many seats, which led to us, again, having unused capacity. After years of uncertainty, the cloud was a welcome disruption. Though the uncertainty has been minimized with cloud technologies, it’s still something that must be addressed when choosing a cloud provider because they’re all so unique. Google has amazing data analytics, storage tools, and a huge background for innovation. Microsoft excels (pun intended) at diagonal integration, meaning MS products work well with MS products. This continues to be one of Azure’s biggest appeals: Businesses often prefer to maintain an existing relationship rather than start a new one. But in the end, AWS has a portfolio of services that exceeds Azure and GCP in both breadth and depth. There are more vendors and solutions across more areas of expertise. So, here is where the uncertainty comes back around. When choosing a cloud provider, the risk of needing to transition to another cloud provider down the road is a HUGE factor we can’t overlook. So if I’m going to place my bet on who I want on my side to battle the future of uncertainty, I’ll always go with a vendor that has the cross-expertise that will allow future growth and innovation. And that’s clearly AWS. Like Bart said, in terms of features, AWS is the clear winner. In fact, if AWS doesn’t provide a specific feature or service, you’ll be hard-pressed to find it with another provider. If a company needs to choose a provider that can cater to all of their unforeseeable needs, that’s going to be AWS. Startups come with plenty of problems, but infrastructure hardware is no longer one of them. Cloud services are scalable, pay-as-you-go, and easily manageable. The biggest choice a startup has to make is which one to use. All three big cloud providers have special programs for startups. AWS Activate allows startups and small businesses to use the same infrastructure that large, established enterprises use — for free. There’s an application process, and it’s unclear what criteria Microsoft uses to select startups for the program. Microsoft appears to do a great job making startups feel like they’ll be well taken care of by choosing Azure. As a startup, it might be tough to know what you’ll need in a year or five years. GCP has a limited feature scope, which is great if you’re building on the things they do well. As Bart mentioned, GCP has world-class storage and analytics features. So in time, you may find yourself unable to perform tasks you’d like to perform — tasks that could be accomplished by using AWS or Azure. If you see this being an issue down the road, you could leverage multiple cloud providers. But, be aware that this is something you’ll need to address at a later date if your business decides to go with GCP. In the beginning, GCP can, for the most part, meet the needs of startups. If it comes down to who makes you “feel” best during the process of starting up a business, Microsoft Azure takes the cake. They have a generous startup package that connects you with selling partners and a marketing strategy. With the second highest market share and one of the most trusted vendors as its backbone, it doesn’t seem like there’s much of a downside to Azure. However, AWS is a really close second. They, too, have a great startup program. It’s not all about the go-to-market strategy. If you’re a forward-thinking business, which all startups should be, you can’t beat AWS. GCP isn’t touting the sales side like Microsoft and Amazon. For startups with a product that makes sense for the platform, the Google Cloud for Startups program is an excellent choice, too. There’s no better price than free, especially when you’re a startup. That’s why being accepted to any of these programs would be a great start for your business. Security, compliance, and reliability are huge concerns for all organizations. The need for those qualities is amplified for government organizations. The federal government has long been contemplating a Cloud First strategy. Now that the cloud has matured and the issue of security has been thoroughly researched, the government is ready to get on board. It took a while, but the federal government is modernizing to the cloud. In fact, the Pentagon just put up for grabs a $10 billion Joint Enterprise Defense Infrastructure contract — or JEDI contract. Cloud providers have started to offer dedicated regions to the U.S. federal government. Because GCP isn’t one of these providers, we’ll only be discussing the benefits of AWS and Azure. AWS. Everything that we’ve said about AWS strengths and weaknesses applies to the public sector, too. AWS must also comply with stringent requirements to house sensitive data and workloads. With one region dedicated to the U.S. federal government, Amazon reports that more 2,000 government agencies already use AWS. They’re the only accredited cloud provider cleared to handle Impact Level 6 workloads, which means everything up to Top Secret. Azure. Azure also carries all its strengths and weaknesses into the public sector. As we’ve said a few times, Azure plays nice with other Microsoft products, and the government uses quite a bit of Microsoft tech. Azure has six regions dedicated to the U.S. federal government, five more than AWS reports. Though Microsoft has been working with the Defense Information Systems Agency to attain Impact Level 6 classification, it’s not there yet. Quite honestly, the winner has nothing to do with technology at this point. It’s going to be handled among lobbyists, contracting offices, and even the courts. Microsoft and Amazon are the front-runners for the winner-take-all contract. However, Oracle recently sued after falling out of the bidding. Not that JEDI is the only or last enterprise contract that we’ll see. But it’ll likely have an impact on the platform of choice for government organizations, which might even be Oracle. Though nobody can confidently say which cloud provider will win the war, for the last decade, AWS has continued to win battle after battle. AWS has been in the cloud game longer than any other player, so they know how to best cater to the many needs of businesses and their projects. They’ve had time to listen to millions of users who leverage their cloud services. From that, they’ve created a product that continually addresses the needs of their users. Though Microsoft and Google (albeit slowly) continue to close the gap, it’s no wonder why AWS possesses the lion’s share of the cloud market.